Will.i.am has turned his hand to the wearable market with the launch of the infuriatingly named i.amPULS, and O2 has told us that it will be selling it exclusively in the UK. Apparently a team of 35 engineers worked for two and a half years to build the device, which comes with 1GB of RAM, 16GB storage, 3G connectivity, Wi-Fi and Bluetooth. It also comes with GPS, a pedometer and an accelerometer which can be used with fitness apps if you're feeling a bit "Big and Chunky" - much like the device itself. A two-inch-wide cuff gives the wearble a distinctive look, with a battery and speaker built into the strap. 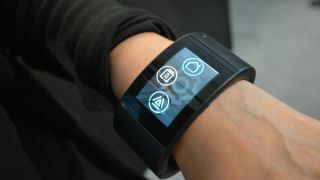 The i.amPULS runs on Android, but no price or launch details have been announced yet. If you're not sold on Will.i.am's device, the new Apple Watch or LG G Watch R might be more to your taste.